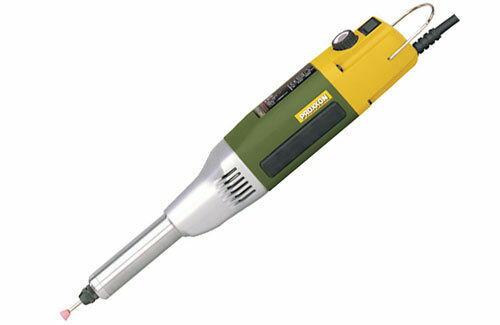 All Products > "28485 Proxxon LBE Long Neck Grinder"
Ideal for working on difficult to reach areas. Features a 100 mm long, slim spindle neck with a gear unit made of diecast aluminium. (dia. 20 mm) For working in places that are almost inaccessible for conventional drills: milling, sanding, polishing, drilling, deburring, trimming A high-speed tool with balanced special motor. Infinitely adjustable electronic speed control (full-wave electronic). Ball-bearing precision shaft made of cut steel. Six 3-slot MICROMOT system collet chucks (1.0 - 1.5 - 2.0 - 2.4 - 3.0 and 3.2 mm) ensure high concentricity. Spindle stopping fixture makes tool changing easier. Technical data: 220 - 240 V, 50/60 Hz, 5000 - 20,000 rpm. Length 300 mm. Weight 630 g. Thanks to the 20 mm spindle neck , the tool is also suitable for use on drilling stands and horizontal stands. (MICROMOT system adaptation) Supplied with a practical plastic carrying case.